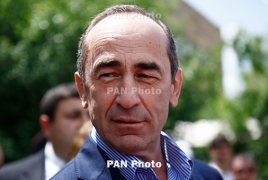 PanARMENIAN.Net - Second Armenian President Robert Kocharian intends to participate in snap parliamentary elections, Kocharyan himself revealed in an interview with Sputnik Armenia. "I announced my return to politics, and, accordingly, will participate in elections. While there is still a lot of time, the situation is developing very rapidly," the ex-President said. "It's best to leave the issue of the format open for now and focus on organizational issues, identify the goals, work on mobilizing those who I trust. "I think the citizens of Armenia need tangible, practical results. I will strive for this, this is my principle." According to him, he is considering the possibility of becoming one of the "opposition poles" of Armenia.